Books in the library have a circle of life. They come in and sit on the shelves, get checked out... and then they come back again. Yup, we've reached the point in the summer where our circulation is way more than our pages can handle. Our reshelving carts are the new go-to place to see if we have any books in popular series in. I always find it interesting to see which series will take off during a particular summer. I remember my first summer at this library, we could NOT keep Magic Tree House books on the shelves. The past couple of summers have been huge for Diary of a Wimpy Kid. 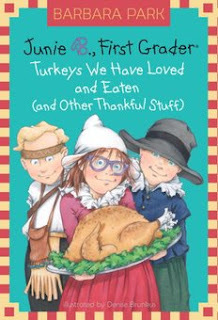 Of course, both those series are super popular, but the surprise runaway hit of Summer 2012 has been... Junie B. Jones. Yup, she's back with a new book coming out next month and the Junie B. Jones Stupid Smelly Bus Tour has made a couple of stops in our area. Other series and topics that have been flying off the shelves: Diary of a Wimpy Kid, Dork Diaries, Big Nate, Star Wars, any superheroes, The Hunger Games, Ninjago (which, we learned, is pronounced nin-JAH-go and not ninja-GO! ), Legos, Ivy & Bean, Bad Kitty, Elephant & Piggie (I'd like to think that's due to our Elephant & Piggie Day we had earlier this month... more on that in another post)... On a suggestion from someone on this blog or on Twitter, I purchased the entire Popularity Papers series and those haven't hit the shelves since (i.e. they're constantly checked out). Signups for Summer Reading Club continue to go like gangbusters. Last week, we rounded 2300 kids signed up, which is a pretty significant increase over last year. We've also had some very successful programs - Professor Steve's Mad Science Show came and we had a Space Explorers program where the kids made their own model "Mars rovers" out of aluminum foil, pie tins, and lots of other random supplies. This week, I've scheduled a break in programming. Since the library's closed for the Fourth of July holiday, it's an ideal time to take a breath. We're still offering some of our less staff-intensive programs (Monday movie matinee and Saturday's Open Art Studio), so the library still has something to offer! I like to give my staff a break in the middle of summer and it's a great time to recharge our batteries for that last little push to get through the end of July. Which series have been the most popular with your kids this summer?